FREE Stabila Black Nylon Level Holder! Scaffold Ratchet Podger Spanner 21mm - ONLY £19.99 ex VAT! 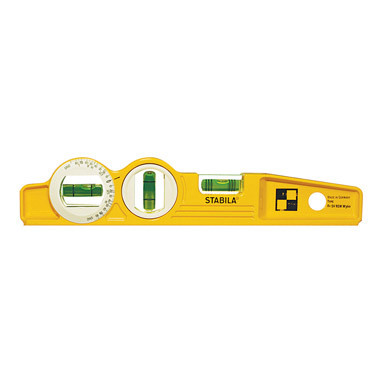 Stabila 10" (25cm) rare earth magnetic scaffolders spirit level. With a 3rd vial - adjustable and marked with the angles a scaffolder needs. Type 81 SV REM W360. Milled base with a V groove and rare earth magnet. For extra secure adhesion to tubes. Six rings around horizontal vial for 1% and 2% slopes. Graduated vial capable of being rotated through 360° - for direct checking of struts and pipes at any angle. Extra-strong pressure-cast aluminium profile for the toughest demands. 1 vertical, 1 horizontal and 1 adjustable vial. Very accurate (to 0.5mm/m in normal position, 0.75mm/m overhead). Designed by scaffolders for scaffolders!